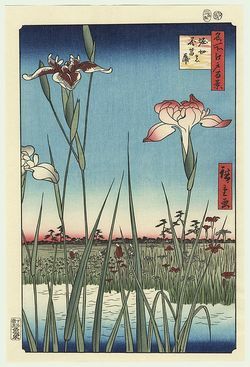 Ukiyo-e refers to the Japanese genre of wood block prints that depict nature, landscapes, town life, and pleasure quarters, with the word itself meaning “pictures of the floating world.” An allusion to evanescence, fleeting encounters and ephemeral visions is fitting for the style of perfumery that has become the trademark of Hermès in-house perfumer Jean-Claude Ellena. His fragrances are marked by minimalism and refinement, and Hermessence Hris Ukiyoé is no exception. It is a fresh green floral composition that is executed with all of the classical Ellena elements intact—sheer floral notes, watery green accords, subtle accents of woods. The prelude to the cold vegetal floral accord is set by citrus, specifically a bright, crisp grapefruit note, which Ellena uses in his various compositions, from Yves Saint Laurent In Love Again to Kelly Calèche. Its sharp fizz contrasts nicely with the watery green accord that forms a large part of Iris Ukiyoé. The iris rendition here is neither the floral-violet softness of L’Artisan Iris Pallida or The Different Company Bois d’Iris (also by Ellena) nor the rooty earthiness of Serge Lutens Iris Silver Mist. The iris is sheer, green, watery and abstract, wrapped well by hedione, a jasmine-muguet aroma material that has a rather luminous, airy character. The acquatic floralcy of the composition reminds me of the effects used in Diptyque Ofrésia or L’Artisan Fleur de Liane, which present different floral treatments, albeit in a similar character. For a light floral, Iris Ukiyoé has quite an impressive sillage and a decent tenacity. Ironically, ukiyo-e were supposed to be inexpensive and mass produced, to satisfy the demands of those who could not afford the real paintings. Of course, Iris Ukiyoé is anything but; it is priced in the luxury bracket and its ingredients are stellar, like those of other Hermès fragrances. The fragrance will no doubt please Jean-Claude Ellena fans and those who appreciate subtle floral compositions. Yet, I do not find Iris Ukiyoé compelling. Like other Hermessence fragrances, particularly Rose Ikebana and Paprika Brasil, it verges on being overly refined and abstract. While I appreciate the concept behind Hermessence as delicately styled fragrance etudes, I find Ellena most evocative in his more developed orchestrations like Cartier Déclaration, Bulgari L’Eau Parfumée au Thé Vert and Terre d’ Hermès. 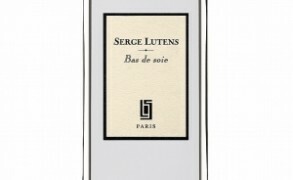 While those fragrances are marked by haiku-like refinement and elegance, they nevertheless are multifaceted and nuanced. Iris Ukiyoé includes note of mandarin, water iris, orange blossom, green shoots, green watery notes. It is a part of Hermès Hermessence line and is available from the Hermès boutiques. Image: Horikiri Iris Garden by Hiroshige (1797 – 1858), from One Hundred Famous Views of Edo series; from Fuji Arts. Isa: I usually like Jean-Claude Ellena’s work and I’m getting more and more interested in iris fragrances. Of course, you need to try it! Did you think that I would do all the work for you?